Road cycling tours don’t get much better than this. Your rewards run as deep as the rich traditional Mediterranean culture on this Sicilian cycling holiday. 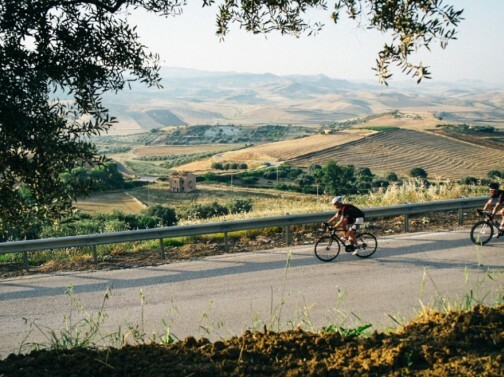 As far as cycling destinations go, Sicily sits amongst the top echelon with its varied and dramatic landscape, rich history and exquisite cuisine make for an unforgettable cycling experience. Ride to the highest point possible of Europe’s largest active volcano Mt Etna. Take in towns of historical importance such as Syracruse and Noto. Climb your way into central Sicily and ride the remote back roads while admiring the unique landscapes and traditional ways of Sicilian life. Relax and enjoy slick descents through the remote mountain regions of the island’s north and cycle the mesmerising Tyrrhenian Coast. 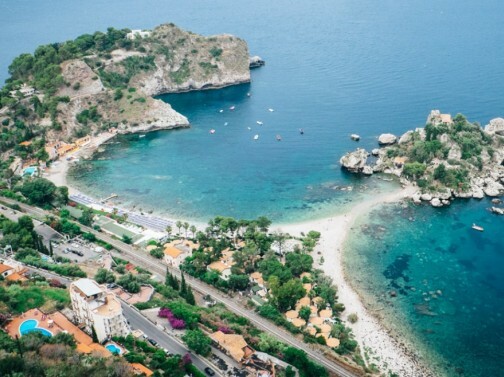 Cycle into Sicily’s most popular summer destination, the cliff top town of Taormina. Spend a rest day in Taormina and visit its many attractions including the ancient greek theatre, the infamous shopping strip of Corso Umberto or treat yourself to a long lunch while you take in the views of the Ionian Sea and Mt Etna. UNESCO World Heritage sites are at almost every bend on this trip and it won’t take long for you to realise that cycling in Sicily will go down as one your most memorable two wheeled adventures. Our cycling trips are designed for the participants to be just more than just ‘fit and healthy’. In our view, rides that require both a physical and mental challenge is a key ingredient to a deeply rewarding cycling experience. We’ve chosen routes that will require you to dig a little deeper in certain stages on the ascents whilst also providing rewarding descents. Alternative cycling routes are also available on most days, so you can dial up or dial down each days physical demands dependent on your skill level or preference. Your support vehicle is also readily available should you need a lift. Come prepared for consecutive days of distances of over 100km. Long climbs are a regular part of your days journey with some steep sections. This Sicily cycling experience has been created for strong cyclists or riders that are in good physical condition. This ride is perfect for those searching for an international riding trip that provides both a mental and physical challenge. In relation to the climbing aspect, you can expect elevation gains of 1000m+ per day. Before setting out on your days ride you will be provided with an opportunity to review the planned route with the freedom to choose an alternative journey should you wish. You will also receive comprehensive route information including maps (e.g. Michelin) and GPS tracks that can be downloaded into your personal computer. You are able to depart your overnight hotel accommodation at a time that suits you and set your own pace once you’re on the road. We prefer riders to pedal in small groups and we discourage riding alone. Your support vehicle will transport your luggage from point to point during your entire trip. You can also take a lift if you feel you need a break from the saddle on any given day. Your guides are there to support you and should you have some technical problems they will be there to provide any assistance you require. You can rest easy, you have full back up. You are required to bring your own bike and lets face it, most of us prefer the comfort and familiarity of our own bike anyhow. We ask that you please ensure that your bike is in good condition prior to your arrival and is set up for hill climbing. Bike rentals are available in most circumstances, please enquire with us and we will be more than happy to assist. Travel Insurance (covering aircraft evacuation) is mandatory for this cycling trip. Any medical and evacuation expenses incurred will be responsibility of the participant. Riders are personally responsible for purchasing comprehensive travel insurance prior to their departure. A comprehensive travel insurance policy will also cover you should you cancel your trip. We have done extensive research on an appropriate policy for our cycling trips so please enquire with us. We fully understand that building a clear outline of your trip is critical for your preparation. Each participant will receive detailed pre-departure trip information covering ever aspect of the proposed itinerary, flying with your bike and much more. A briefing session will also be held prior to your first days riding. Have other questions? We can tailor a cycling trip for you regardless of the number of riders, be it 2, 8 or 20. Get in touch with us and let’s discuss your options. Cancellation assessments will be calculated on the day we receive your notification. Please note that any payments made to an airline on your behalf may not be recoverable and will be subject to the airlines cancellation policies. Electronic Funds Transfer into our Bank Account. Details will be shown on your invoice. Travel insurance (covering aircraft evacuation) is mandatory and is the responsibility of each individual. Should you need assistance with travel insurance, please let us know we can assist in finding the most appropriate cover. Trip participants have a certain responsibility to the tour operator, guides and other trip participants. Trip participants are responsible for: understanding the conditions implied in the Trip Itinerary, selecting a trip that is appropriate to their interests and abilities, preparing for the trip accordingly and having the proper bike and equipment needed for the selected trip. A participant may be asked to leave a trip if the leader feels that the person’s continued participation may prove detrimental to the individual or to the well-being and enjoyment of other guests. Arrive at Catania Airport where you will be warmly greeted by your guide who will take you to our hotel. Build your bike and take to the road for a ride around lively Catania. Spectacular Taormina deserves a full day to explore its many tourist attractions. See the Greek theatre, hit the shops or have a long lunch while taking in the views of the Ionian Sea and Mt Etna. If you prefer to go riding, you have to option to circumnavigate Mount Etna. Transfer to Catania airport for mid-day flights home.